The first thing to point out is that, no, The Sims 4 doesn’t look a lot better than The Sims 3. This is understandable considering that EA wants to make the game accessible to the largest possible audience, including gamers who probably play little other than The Sims, and that necessitates low system requirements. The fact that immediate playable world is smaller than in The Sims 3 would lead one to believe that they could have done more, visually, but unfortunately that is not the case. 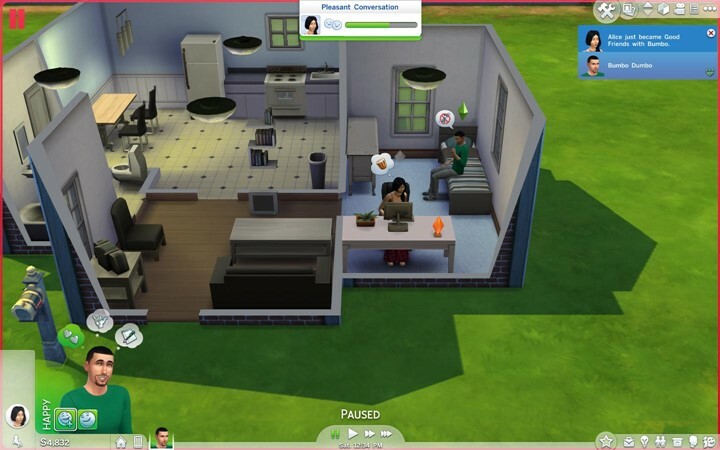 Aside from the user interface, I don’t believe I could tell a screenshot of The Sims 4 apart from The Sims 3. The music is faithful to the series’ past tunes and the sim speak sounds like it always has, but the audio cues the game uses to signify events are well done and do a good job at keeping you abreast of events regarding your sims, and I like them allot more than their Sims 3 counterparts. For all of the comparisons I’ve made to The Sims 3, The Sims 4 reminds me more The Sims 2. The whims your sims have remind me of the wants and needs mechanic from The Sims 2, for example. The most obvious connection is the limited scope of the game world that results in sitting through a number loading screens while playing. Each time you leave your house, be it to your neighbor’s house or a public place, there’s a loading screen to sit through, and while they’re not very long on average, they can be frustrating for people used to The Sims 3’s open world. A big change from The Sims 2 is that time is no longer locked for lots you’re not currently on, and other sims in your world will age along with your sims. It was funny to watch Bumbo Dumbo, my main sim, go from young adult to elder and watching his once vibrant neighborhood become a senior citizen retirement community. One thing I miss from The Sims 3 is reading the local events in the newspaper. 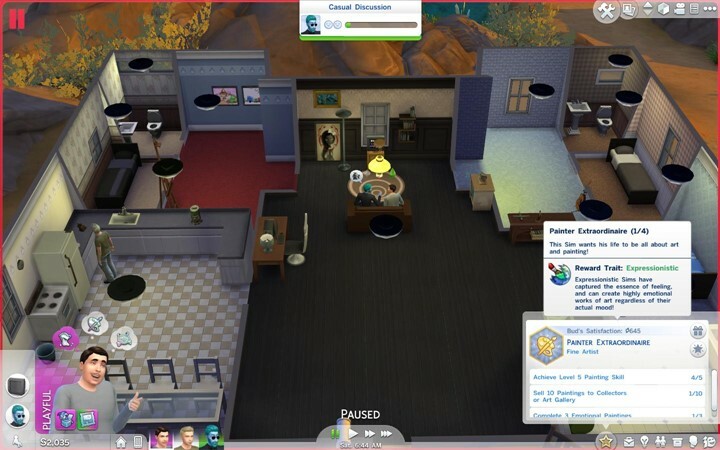 In fact, there is no newspaper at all in The Sims 4, so you go about getting work – a staple use for the newspaper since the original The Sims – through your ubiquitous cell phone. Once buried under menus in The Sims 3, here it is prominently displayed next to your sim’s profile picture on the interface, emphasizing its increased importance. The emotions system is much a nice game mechanic in how the various emotions effect your sim’s performance and abilities. If your sim is feeling Energized, for example, they can do sit ups and pushups to improve their fitness skill. You can use items in your house to influence your sims’ emotions, be it taking a Thoughtful shower to become inspired or putting an inspirational postcard on the wall to get the Inspired emotion, thereby giving you some degree of control over your sims’ performance. Bumbo Dumbo for example had a couple of inspirational postcards in his computer room, so while he was scribing books he had the Inspired emotion and wrote better. It’s not always that easy, as some negative emotions can override your positive ones if you’re not careful. It’s never fair to a new game to be compared with another one that has years of add-ons and expansions under its belt, but that’s the curse of The Sims series. The Sims 3 had numerous expansions and furniture packs, along with a load of individual downloadable furniture available on EA’s website, not counting community made mods and patches. The Sims 4 obviously has none of that from day one, but more troublesome are the features from The Sims 3’s launch state that are missing here. Swimming pools are absent, with EA stating that they were deathtraps for sims as people would start a sim swimming and remove the exit ladders, resulting in sims drowning. Apparently this was too dark an image for EA, so they removed pools entirely. EA’s careful curation of experiences in The Sims 4 is curious. They want to present a light-hearted view of The Sims here, and as a result, I think they’ve curbed some of the player freedom, since for some players, tormenting their sims was the highlight of the game. Disasters in general are toned down or missing, with robberies completely gone and fires far more rare. As for how the game plays, I like the interface a lot. It reminds me of Sim City‘s interface, which I liked, and that makes sense because EA brought some of that game’s UI development team over to help design the interface here. It’s clean, sharp and easy to navigate, with all of the information you need within easy reach while keeping the screen uncluttered. The interaction menus are a little cumbersome with their many layers to navigate, but the result is access to many more options for each object. My main irritation lies in the “go here” command that comes up when you click on the ground being too easy to accidentally click on while trying to dismiss, sending a move command to your sim unintentionally. House building is largely the same as you’ve come to know aside from the ability to buy, move and resize rooms in their entirety. This is actually quite a useful feature, since you can just grab the edge of a room to resize it and the furniture in the room moves to accommodate your changes. Despite being a step back from The Sims 3 in its world design and not making any real strides in presentation, The Sims 4 is a solid entry to the series, and one that I actually prefer to The Sims 3. Sims 3 was more accommodating for large stories with its open world, but I like the more focused nature of The Sims 4. It puts the emphasis back on your individual sims and their lives, where it belongs. Assuming that future expansions provide the usual level of additions, The Sims 4 has a bright future. It’s always hard to leave all of the options from a fully expanded Sims title for a new, more bare-bones release, and The Sims 4 will rub some people the wrong way with its constrained nature, so if you’re on the rail about The Sims 4, I’d hold off until the first expansion is announced to see if it brings what you’re looking for. Otherwise, I would pick it up. The familiar The Sims gameplay is alive and well here, and the cheeky charm missing from The Sims 3 has returned. It’s not revolutionary, but it is entertaining, and that’s a good starting point for the next edition of The Sims.